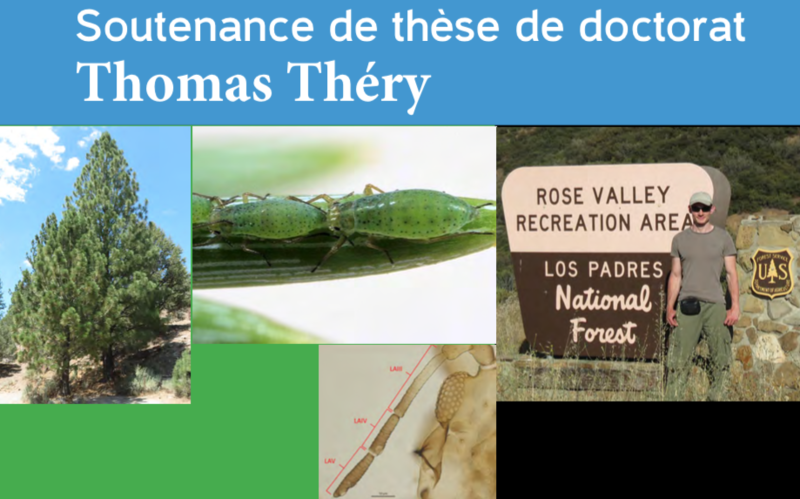 In April 2018, Thomas Théry successfully defended his doctoral dissertation. Almost a year later, his erstwhile advisor publicly celebrates the completion of his first PhD student’s studies. Entitled “Molecular systematics of the genus Essigella (Hemiptera: Sternorrhyncha)“, Thomas’s dissertation presented three published chapters. Species of the aphid genus Essigella are found natively only in North America, feeding along the lengths of pine needles. The taxonomy of the genus was last treated by John Sorensen in 1994. He used difficult, time-consuming, but effective multi-variate morphometric methods to delineate the species. Thomas sought to corroborate or challenge Sorensen’s taxon concepts using molecular methods. 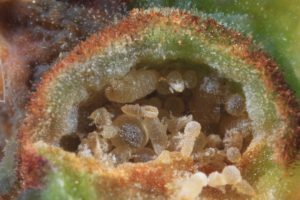 In his first chapter, published in Insect Systematics and Diversity, Thomas used genes from the aphids’ nucleus, mitochondrion, and obligate nutritional symbiont Buchnera aphidicola and several molecular species delimitation methods. It was indeed a relief and a pleasure to find that, by and large, his results corroborated Sorensen’s. Thomas did find a few additional species, however, and he proceeded to describe and name them formally in his follow-up publication in ZooKeys. Thomas’s species descriptions were innovative in that he used actual genetic nucleotide differences as diagnostic characters for his new species, something rarely done in animal taxonomy and never done before with aphids. Not to court too much controversy, Thomas made certain to include morphological diagnoses as well! The third chapter of Thomas’s dissertation was actually the first one published. 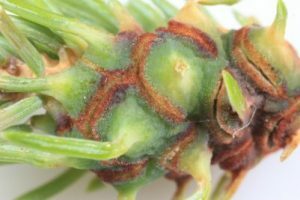 We’ve already described that work on the Monterey pine needle aphid colonizing new geographic regions. 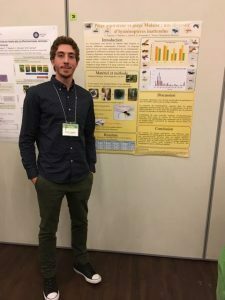 Thomas landed a full-time employment at the Insectarium of Montreal, just next door to the Biodiversity Centre, so we are pleased to see him regularly as he comes to work on his beetles at the Ouellet-Robert collection. Yes, that means that despite having worked on aphids for his PhD, we were unsuccessful at taking the histerid out of this coleopterist. We’re proud of you anyway, Dr Théry, congratulations! 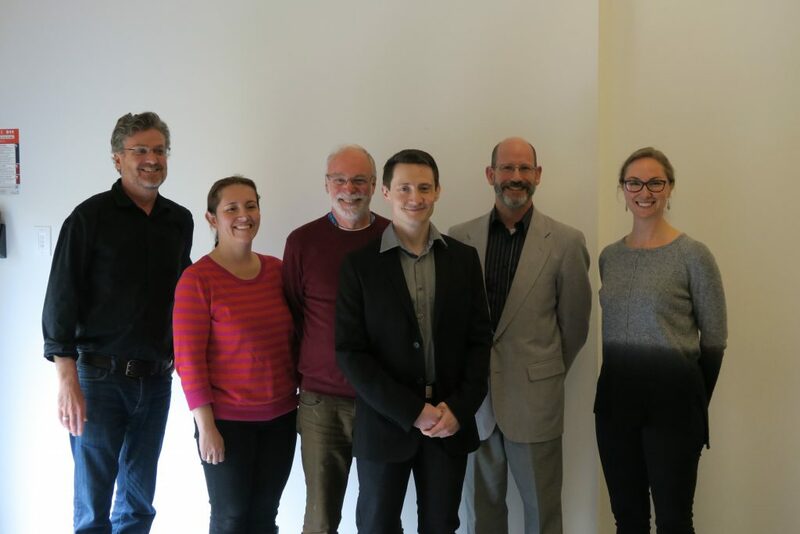 Thomas and his thesis defence jury: Chris Cameron, Liliana Perez, Luc Brouillet, Colin, and Jade Savage. Aphis lugentis is an aphid species relatively common in North America, feeding primarily on Senecio, a genus of the daisy family. 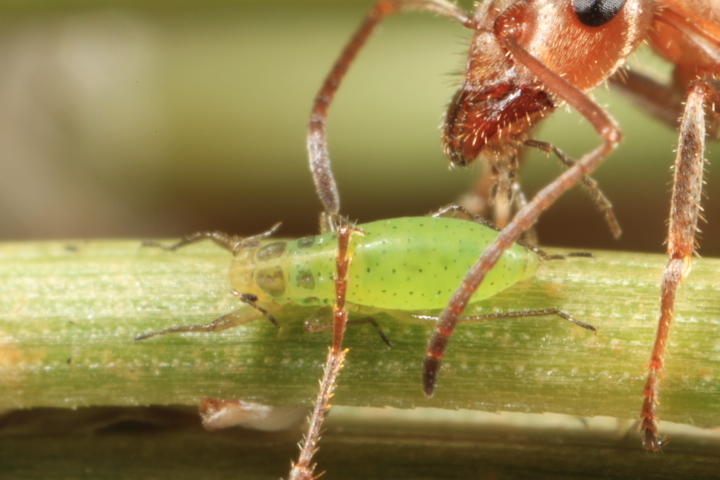 This aphid species had recently been found in southern France and in a new publication, we document its presence across the Mediterranean in Tunisia, as well as in South America, namely Argentina, Chile, and Peru. In order to confirm the identity of our samples, we examined them under the microscope and sequenced their barcode gene. 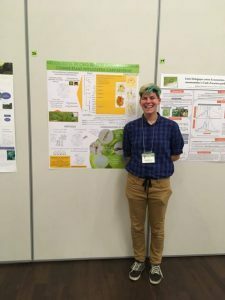 Publication of the note in the Proceedings of the Entomological Society of Washington implicated eight co-authors from four countries, including two undergraduate interns in the Favret Lab. 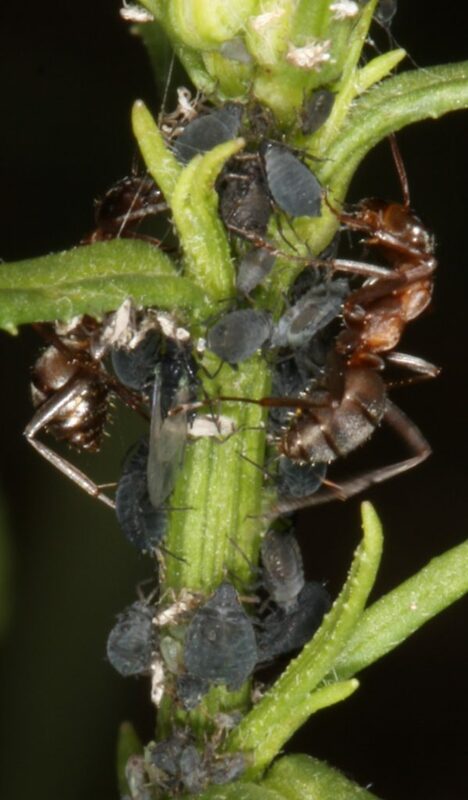 Aphis lugentis from France, tended by ants. Photo by Armelle Cœur d’acier, used with permission. The recreational use of marijuana becomes legal across Canada today. Of course increased cultivation of Cannabis sativa will accelerate research on this species, as was highlighted in the scientific journal Nature. It will also mean the need to protect the crop against insects and other injurious organisms. One such insect is the Cannabis aphid, Phorodon cannabis. This Eurasian species was recently introduced to North America. 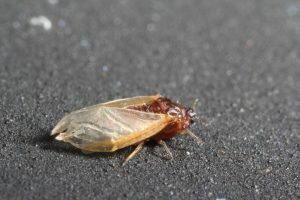 In a recent publication, my colleagues and I brought attention to the presence of this insect in the United States and Canada, in fields and greenhouses. We also discussed its biology and taxonomy. 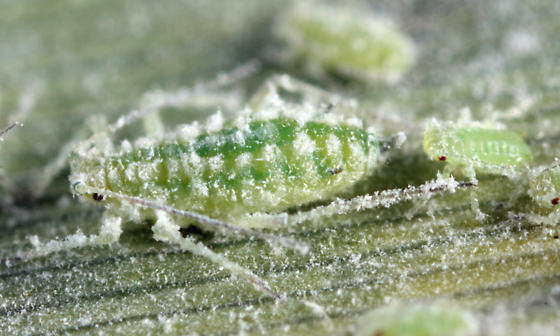 The aphid has already caused crop damage but its full economic impact remains to be seen. 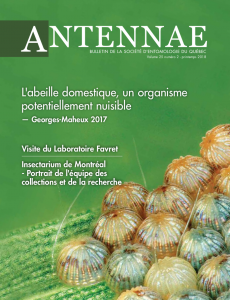 The members of the lab were featured in the spring (2018) issue of Antennae, the Bulletin of the Quebec Entomology Society. Read it here in French. The mealy plum aphid. Unaltered, ©2013 by Tom Murray, BugGuide. CC BY-ND-NC 1.0. 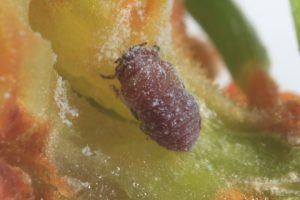 The mealy plum aphid, Hyalopterus pruni, along with two other species of Hyalopterus, are important pests of peaches, apricots, plums, and almonds. Unfortunately, there were 13 separate species names for only three valid species. In order to associate the 13 names with the three species, we published a taxonomic revision of the aphid genus Hyalopterus. The project involved five authors from five different countries, and the results were published at the end of 2017. 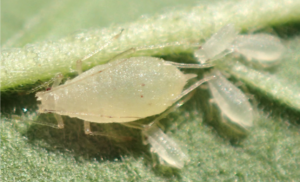 Establishing the correct names for the three valid species will help researchers on these pest aphids better communicate their work. The paper is available at the Proceedings of the Entomological Society of Washington. Or just drop Colin an e-mail for a personal delivery! Adelgids are sometime conifer insect pests; of particular note is the hemlock woolly adelgid. A large number of species alternate host, forming galls on a spruce one year and migrating to the bark or needles of another kind of conifer the next (fir, hemlock, larch, pine). While preparing a catalog of adelgid species, I discovered that there are actually three names referring to the same family. According to the rules of the zoological nomenclature, when two scientific names apply to the same animal (synonyms), it is the older that takes precedence. Unfortunately, the other two names, published in 1901 and early 1909, both have priority over Adelgidae, published in late 1909. Because Adelgidae is used much more often than the other names, to protect the stability of the nomenclature and the research on this important insect family, I prepared a petition, submitted to the International Commission of Zoological Nomenclature, to protect the name Adelgidae by suppressing the other two. With the support of many of my fellow aphidologists, I am confident that my request will be granted, but in case it is not, we will have to start using the name Chermaphididae to refer to this family! Best presentation in ecology and evolution at the 17th annual symposium. Congratulations Anaïs! 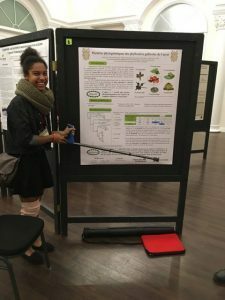 Three undergraduate students presented excellent posters at the annual meeting of the Entomological Society of Quebec. 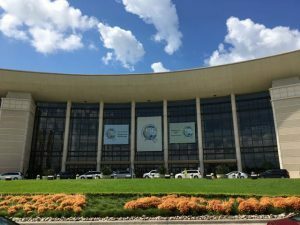 Boasting the largest assembly of entomologists the world had ever seen, The International Congress of Entomology was held in Orlando, Florida, USA, during the last week in September 2017. During the symposium, Colin and hosted and he and Thomas Théry presented at the Synthesis in Sternorrhyncha Systematics symposium. 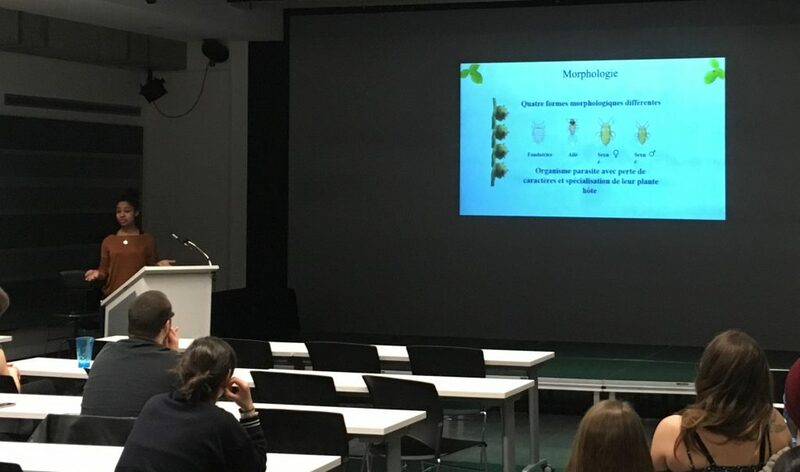 Auxiliary meetings were held in conjunction with the ICE, and Colin presented at the meetings of the International Aphid Genomics Consortium and the Entomological Collections Network.